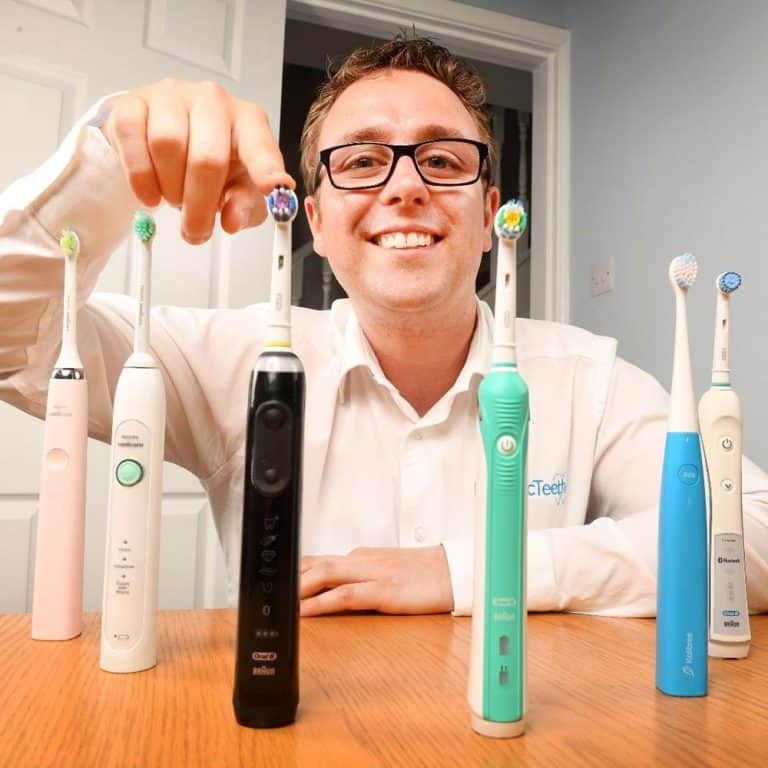 In 2017, Oral-B launched the Pro 2 2000, which is a newer version of the Pro 2000 that we originally wrote about in this article. The two models are the same except the newer version has a different type of battery that lasts longer. Any references to the Pro 2000 in this comparison are also applicable to the new model, the Pro 2 2000, and we still recommend that over the 650. In our opinion with all things considered is the Pro 2000 is the one to go for, if the budget can stretch. Pro 650 is available in only one colour compared to the 2 colour options of the Pro 2000. The Pro 2000 has the addition of a pressure sensor. 2 cleaning modes are available on the Pro 2000 compared to the 1 on the Pro 650. Pro 650 connects to an app using sound connectivity to record brushing habits. A travel case comes only with the Pro 650. Pro 650 generally cheaper to purchase. Detailed Comparison: what’s the difference between the Oral B Pro 650 and Pro 2000? The Pro 2000 was the first of the two brushes to become available on the market back in the middle of June 2014 with the Pro 650 following in August. We’ve completed a detailed review of both these brushes so we know them very well at this point. Here’s our Pro 2000 review, and here’s our Pro 650 review. On the face of it, both brushes look very similar in terms of their design, styling and visual appeal, there is not much to tell them apart. Read on to find out the main differences between the Oral B Pro 650 vs 2000. The Pro 2000 is available in colour options of Blue/White and Pink/White whereas the Pro 650 comes in a more masculine Black/White only colour combination. It is the rubber grip on the handle of the brush that actually varies in colour and either feels good in the hand. Both brushes are designed to serve the entry/lower mid range market of those looking for an electric toothbrush and both would be considered relatively good value for what they offer. The Pro series use a different brushing technique compared to the TriZone models you may also see on shop shelves. We’ve taken a detailed look at the differences between Pro vs Trizone here. With the 2000 there are two cleaning modes, these are daily and gum care, whereas the Pro 650 sticks with just daily clean mode. The Pro 2000 also benefits from the addition of a pressure sensor which will illuminate when the brush detects too much pressure being applied to the teeth. Both have built in timers to assist with the 2 minute clean and both come with a brush head and charging station in the box. The generally cheaper 650 does come with a travel case in the box, which makes for more convenient transportation of the brush if taking it in a bag when travelling. Both boast a reasonable battery life of 7 days which is quite good considering the size and profile of them. You may think that the Pro 650’s extra feature ‘sound connectivity’ would impact the battery life, but it does not as it is your smartphone running the Oral-B application that uses built in microphones to pick up the sound of the brush and begins logging the data for review live or later. When we reviewed the Pro 650 we gave it a rating of 4 and we gave the same to the Pro 2000 in our review. Due to the very similar features that the brushes offer it is not all that easy to pick which is the better of the two. The pressure sensor does add some value and is typically the reason why it is considered the premium brush, along with the secondary cleaning mode. Experienced electric toothbrush users are unlikely to need the sensor as you will know the right amount of pressure to apply. Whilst neither brush are easy to accidentally activate the inclusion of a travel case in the 650 is handy for those that travel to protect the brush and a brush head. I wish not to refer to the sound connectivity as a gimmick, but the reliability and amount of data obtained from this is limiting and if serious about logging oral hygiene routine, then more premium brushes like the Pro 6000 should be sought. As mentioned above, the Pro 2000 (see it here on Amazon) is the brush we would choose out of these two, but the Pro 650 (see it on Amazon) is a worthy alternative, and really it depends on which one has the best deal when you come to buy.